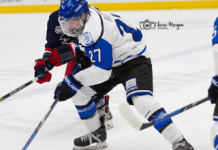 October 2, 2012 – Alberni Valley Bulldogs forward Evan Tironese has been named the BCHL Player of the Week for the week ending September 30th. Tironese racked up six points in two games as the ‘Dogs split their weekend games. The Qualicum Beach product began with a goal and two assists in a loss to the Cowichan Valley Capitals. He then notched two goals and one helper in a 5-2 win over the Nanaimo Clippers. The 17-year-old has now had three consecutive three-point games and currently leads the BCHL in scoring with six goals and nine assists.